The founders of this class were the first in the Realms to discover the ability to walk through the Veil. As such, Veilstalkers are a bit proud, or even sometimes haughty, when it comes to their place in history. Their ability to move through the Veil is unsurpassed among the Realms, for they possess a deeper history and knowledge of its mysteries. However, over time, this mastery comes at a sacrifice: their bodies pay a heavier price for walking through the Veil than other classes do. We are as one with the Veil. 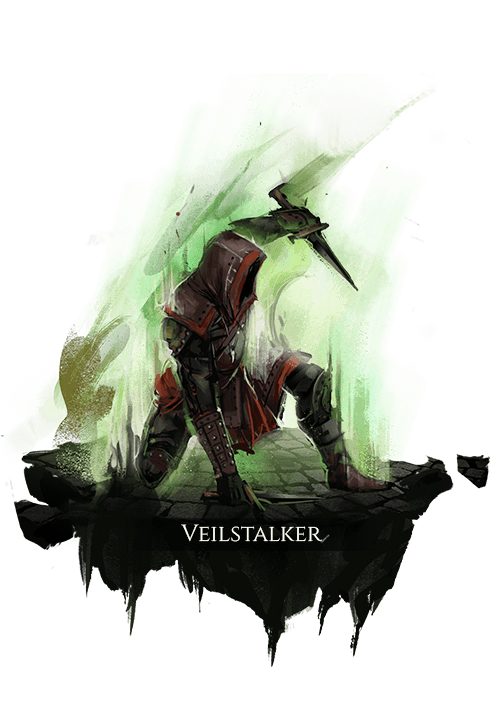 for a moderate duration that damages other players entering or exiting the Veil nearby. Arcane Charge drains progressively faster the longer the user remains outside the Veil. Arcane Charge regenerates over time while inside the Veil and quickly regenerates during Veilstorms. Attacks gain bonus disruption damage based on Arcane Charge. Opens a personal gateway between the natural world and the Veil, and draws the user through it. consumes Arcane Charge to apply an arcane debuff that deals arcane damage over time for a brief duration. debuff that immobilizes the target for a brief duration. Purges the target’s earth, water, fire, air, frost, and lightning buffs with a total amount of power based on the user’s remaining Arcane Charge. The user’s body bursts into an explosion reminiscent of the Piercing of the Veil when they die, creating a large amount of Veil disturbance and dealing high disruption to all nearby enemies.